Acetylcholine is a transmitter in preganglionic autonomic and postganglionic parasympathetic nerves and a non-neuronal paracrine mediator in the alimentary tract. Acetylcholine is involved in the control of almost any function within these organ systems, and almost every cell type expresses multiple muscarinic receptor subtypes. Although muscarinic receptors at non-neuronal effector cells commonly are of the M3 subtype, the population usually consists of a mixture of muscarinic receptor subtypes often co-acting postsynaptically. However, the pattern of heterogeneity of varies between different tissues. The population in gland parenchymal tissue often consists of a mixture of M1 and M3 receptors, smooth muscle tissue of the gut of M2 and M3, blood vessels of M1, M3, M4 and M5 and neuronal cells of M1 and M4. Nitric oxide production, effects on inflammation and proliferation may involve M1, M3 and M5 receptors. Muscarinic receptors expressed on nerve terminals may indirectly modulate the responses by inhibition or facilitation of neuronal transmission in the autonomic nervous system. The present review describes signalling mechanisms, expression and functional effects of muscarinic receptors in salivary glands and in the gastrointestinal tract. Muscarinic receptors are commonly expressed in the digestive tract and are of utter significance for organ function (1-3). The tissues and cell types expressing the receptors are numerous and include salivary glands, smooth muscle and mucosal cells in the stomach and the intestine. Orthodoxy, peripheral muscarinic receptors were regarded as a homogeneous receptor group evoking either smooth muscle contraction or glandular secretion. Today the muscarinic receptors are considered to comprise five subtypes - muscarinic M1, M2, M3, M4 and M5 receptors (4, 5). The intronless genes encoding the receptor subtypes have been cloned from several species and show a high sequence homology of the subtypes in all species so far examined (6-8). Originally, the muscarinic receptors mediating the metabotropic effects of acetylcholine at non-neuronal effector cells were thought to be of the muscarinic M3 receptor subtype (9, 10). Although it has been well recognised for a long period of time that other subtypes of the receptor can be found on glandular as well as on smooth muscle cells when examined morphologically, the functional significance of the different receptor subtypes has not been fully unravelled. The subtypes of the receptor population interact on neuronal as well as on non-neuronal cells in regulation of autonomic responses (11, 12). However, lately muscarinic receptors have been suggested to be implicated in the control of inflammation, cell growth and proliferation also (13-18). Muscarinic receptors belong to the family of G-protein-coupled receptors. The G-proteins are heterotrimeric guanine nucleotide-binding proteins that regulate second messengers and ion channels (19). They consist of one -, ß- and -subunit, and on the basis of the a-subunits primary sequence homology, the G-proteins are characterized into G s, G i/o, Gaq and G 12 (20). Receptor activation splits the heterotrimeric G-protein into - and ß/ -subunits, of which the G subunits primarily regulate intracellular responses. The subunits of G-proteins activate distinct cellular pathways and the muscarinic receptor subtypes couple differentially to the G-proteins. Whereas muscarinic M2 and M4 receptors preferentially couple to G i/o, muscarinic M1, M3 and M5 receptors couple to G q/11. The Gß subunit is a pathway by which at least the muscarinic M2 receptor, in addition to the M3-receptor, may activate phospholipase Cß and modulate ionic conductances (21). Also, muscarinic M2 and M4 receptors may inhibit adenylate cyclase activity, prolong the opening of potassium as well as that of non-selective cation channels and of transient receptor potential channels (22). Muscarinic M1, M3 and M5 receptors, on the other hand, increase intracellular calcium by mobilizing phosphoinositides that generate inositol 1,4,5-trisphosphate (InsP3) and 1,2-diacylglycerol (DAG (23, 24)). However, the muscarinic M1, M3 and M5 receptors differ in their coupling to Gs . While the muscarinic M5 receptor activates down-stream enzymes less efficiently than the muscarinic M3 receptor, the M3 receptor activates the G-protein less efficiently than the muscarinic M1 receptor (25). Even so, all three subtypes have in common a production of InsP3 and DAG as a result of the activation of phosphoinositide-specific phospholipase Cß. In addition, the muscarinic receptors regulate a number of other signalling pathways that appear to participate in muscarinic receptor control of inflammation, cell growth and proliferation (23). These pathways include both G i/o- and G q/11-coupled molecules, but may also involve the Ras homology family of small GTPases (RhoA; (26, 27)). RhoA may mediate inhibitory effects on myosin phosphatase, involving Rho-kinase and a myosin phosphatase inhibitor phosphoprotein (protein kinase C (PKC) potentiated inhibitor protein-17 kDa; CPI-17) (28-30). Furthermore, phosphoinositide-3 kinases, non-receptor tyrosine kinases and mitogen-activated protein (MAP) kinases (extracellular-signal-related kinase 1 and 2; ERK1, ERK2) have been discussed in the context of muscarinic receptor intracellular mechanisms (31-33). A pathway for activation of RhoA and the transcription factor, serum response factor, involving tyrosine kinases has been suggested to be activated uniquely by muscarinic M1 receptors and not to be shared by muscarinic M3 receptors (34). A signalling molecule activated by muscarinic receptors is sphingosine kinase (35). Sphingosine kinase metabolises sphingosine into sphingosine-1-phosphate (S1P) and the intracellular S1P then mediates rise in intracellular calcium. S1P may be a factor linking calcium store depletion to downstream calcium entry (36-38). Fig. 1 indicates possible pathways by which muscarinic receptors may interact in inducing physiological, inflammatory and proliferatory responses. Fig. 1. Principal intracellular pathways for excitatory (M1/3/5; via Rho, PIP2 or S1P) and inhibitory (M2/4; via K+ or AC inhibition) muscarinic receptors. The figure indicates possible inflammatory (PG, NO), proliferatory (MAPK) and contractile (MLCK, CaM; indirect via cAMP inhibition) effects. Stimulatory effects are indicated by arrows and inhibitory effects by lines with a round ending. Neuronal muscarinic receptors are widely expressed in the peripheral nervous systems (5, 39, 40). While antagonists with selectivity on M2/M4 over M1/M3/M5 receptors increases cholinergic overflow by reducing autoreceptor inhibitory function, antagonists with the reversed selectivity profile may decrease overflow, thus reflecting blockade of facilitator receptors (1, 12). The prejunctional inhibitory muscarinic receptor was for long considered to be of the M2 subtype (41-44). In some organs, binding studies have indicated the best correlation to the muscarinic M4 receptor and not the muscarinic M2 receptor (45-48). The same conclusions have been made out of morphological and functional observations in salivary glands (49). Furthermore, facilitator muscarinic receptors have been reported in salivary glands, in the urinary bladder and in the gastrointestinal tract (50-54). Thus, the presence of two distinct subtypes on prejunctional terminals is consistent with inhibitory/facilitator autoreceptor roles in several peripheral tissues, including smooth muscle and glandular tissue (55, 56). Presynaptic muscarinic M2/(4) receptors may affect neuronal function via a G-protein-linked pathway, by which terminal K+ conductance could be increased and thereby indirectly limiting presynaptic depolarization and Ca2+ influx necessary for release (57-59). Muscarinic M1 receptors have in a similar way been shown to cause a slow membrane depolarization via inhibition of K+ currents (17, 60). However, both muscarinic M1 and M2 receptor subtypes could alternatively modulate transmission via non-Ca2+, non-K+ channel-linked mechanisms (61, 62). Accordingly, the receptors may modulate transmitter release by coupling to serine-threonine kinases PKC and protein kinase A (PKA (63, 64)). Both kinases seem to stimulate transmitter release, though in normal synaptic function only PKA is active. When the balance of the two receptors is altered, that is between muscarinic inhibitory M2/M4 and facilitator M1 receptors, a M1-mediated increased PKC activity-dependent potentiation of release or an M2-mediated decreased PKA activity-dependent reduction of release may occur (64). Under normal conditions, the prejunctional muscarinic receptors seem to perform an inhibitory function on the release. It has generally been agreed that muscarinic M3 receptors mediate most postjunctional effects. In the digestive and lower urinary tracts they evoke contraction of smooth muscle and secretion from glands (65-67). However, postjunctional muscarinic M2 receptors also occur, commonly co-localised with the muscarinic M3 receptor. Studies in several species, including man, indicate synergistic effects of M2 and M3 receptors in controlling smooth muscle contraction (68, 69). Inhibitory G-proteins activated by muscarinic receptor agonists may modulate calcium-acvitated K+-channels in the smooth muscle cells, which counteract any hyperpolarising stimulus (70). Inhibitory muscarinic M2 receptors may also open non-selective cation channels by which a sustained influx of sodium and calcium ions occurs, and further, inhibit adenylate cyclase activity. However, this effect of muscarinic M2 receptors seems to require a concomitant stimulation (e.g., by M3-receptors) of the InsP3-pathway and the intracellular release of calcium (71). Also, the regulation of ion fluxes may involve synergistic effects via the TRPC-encoded (transient receptors potential canonical) proteins and calcium permeable cation channels (22, 72). Possible interactions between muscarinic M2 and M3 receptors may also occur by other intracellular mechanisms concerning contractile effects. In smooth muscle, muscarinic M2 (and possibly M3) receptors may increase S1P and by that activating store-operating Ca2+-channels (35, 73). In the presence of specific inhibitors of sphingosine kinase, muscarinic-induced contraction can be attenuated in smooth muscle preparations (38). Muscarinic M2 receptors also affect the contractile smooth muscle response via activation of RhoA. This results in a calcium sensitisation enhancing smooth muscle contraction. Moreover, muscarinic M2 receptors may activate cation channels and thereby increasing [Ca2+]i (74-76). Sakamoto et al. demonstrated three distinct pathways mediating a muscarinic cationic current (MICat) generation. Either of M2 and M3 receptors activates two of these pathways, whereas the third requires both M2 and M3 receptors to be active. The M2/M3 pathway was the major mediator of whole-cell MICat and potently depolarized the membrane. The definition of a M2/M3 pathway is consistent with the existence of a signalling complex involving the M2-Go system, the M3-PLC system and a cationic channel system mediating MICat. In glandular tissues, synergistic effects between muscarinic M1 and M3 receptors occur and activation of both subtypes of receptor may be a pre-requisite for maximum responses in salivary glands (77). Although the muscarinic M1 and the M3 receptors show resemblance according to intracellular pathway activation, differences occur (34, 78, 79). To examplify, TRPC-encoded proteins are implicated in glandular secretory responses (80, 81) and activation of TRPC6 channels is correlated with the formation of a multiprotein complex including muscarinic M1 receptors and PKC (82). Even though all the subtypes of excitatory muscarinic receptors increase [Ca2+]i (23), they seem to affect Ca2+ channels differently; i.e., muscarinic M3 and M5 receptors activate T-type calcium channel, which muscarinic M1 receptors do not (83). Inhibitory muscarinic receptor intracellular pathways could possible evoke smooth muscle relaxations directly. However, muscarinic receptors usually evokes relaxation indirectly via paracrine substances, such as nitric oxide (NO) and prostaglandins (84-91). The effects via NO can be exerted by induction of different isoforms of NO synthases (92-98). Muscarinic M1, M3 and M5 receptors evoke NO formation Ca2+-dependently via soluble guanylyl cyclase and cyclic guanosine monophosphate (cGMP) (19). However, not only the smooth muscle function may be affected by muscarinic stimulation of NO generation, but also glandular secretion (99-106). Acetylcholine has been shown to mediate effects influencing inflammation within different organs (107, 108). So, have muscarinic M3 receptors been reported to induce release of prostanoids and inflammatory mediators from epithelial cells (e.g., phospholipase A2 activation and prostaglandin E2 release) (109), muscarinic M1 receptors to stimulate neutrophil and monocyte chemotactic activity (110) and muscarinic M3 and M5 receptors to stimulate differentiation of cultured inflammatory cells into monocytic/macrophagic cells (111). The role of muscarinic receptor effects is ambiguous according to inflammation. While pro-inflammatory effects, such as increase in the release prostanoids, may be stimulated by acetylcholine, inhibition has been shown according to other, such as tumour necrosis factor (TNF) (108). Muscarinic receptors seem to participate in remodelling processes known to occur in chronic inflammatory diseases (112). In cancer cells, the muscarinic M3 receptor has been linked to cellular proliferation (113, 114) and acetylcholine seems, at least partly via muscarinic receptors, to be involved in the control of epithelial cell adhesion, cell–cell interactions and proliferation of epithelial cells (115-121). Muscarinic M1, M3 and M5 receptors may all posses inhibition of apoptopic cell death (122). In addition to the inflammatory and proliferatory effects by muscarinic M2 receptors involving S1P (38), the receptor may induce promotor mutagenesis by a signal transducer and activator of transcription element (123). Even though muscarinic receptor stimulation by its own causes no proliferation, it may induce cell growth and proliferation when acting together with other stimuli. So, together with either epidermal growth factor (EGF) or platelet-derived growth factor (PDGF), which mediate proliferative stimuli themselves, muscarinic stimulation enhances the proliferative effect (124, 125). A transactivation of EGF regulatory pathways has been suggested for acetylcholine (126) and both muscarinic M1, M2 and M3 receptors have been shown to be possible candidates for exerting the effect (127-129). The secretion from salivary glands fulfils different functions such as rinsing, protection including antimicrobial and moistening functions, remineralisation and also digestion. The regulation of the amount and quality of saliva is dependent on constant fluid delivery provided by the blood flow and on the type of stimulation of glandular activity. Muscarinic receptors play a key role in most events in salivary glands and the involvement of muscarinic receptors in the control of these different events is discussed below. The control of salivary secretion depends mainly on nerve reflex impulses that involve the parasympathetic and sympathetic secretomotor and vascular nerves and the autonomic nerves reach most cell types in salivary glands (100, 130-132). While parasympathetic activity evokes a copious secretion relatively poor in protein, activity within the sympathetic innervation evokes sparse but protein-rich saliva. Secretion and blood flow are thus controlled by acetylcholine and noradrenaline but are also regulated by neuropeptides, such as vasoactive intestinal peptide (VIP; reviewed in (133, 134)). Vasodilatation in the salivary glands caused by acetylcholine and VIP release from parasympathetic nerves (135-137) also involves NO modulator mechanisms and possibly other endothelium-derived hyperpolarizing factors (87, 138-140). Blood flow is not a secretion-limiting factor initially, since the interstitial fluid will preserve the response (141, 142). However, in short, because of increase in intravascular oncotic pressure, salivation will cease unless the blood flow increases (143, 144). The increase in salivary flow evoked by muscarinic agonists has generally been attributed to activation of muscarinic receptors solely of the M3 subtype (9, 145). This concept has been supported by findings obtained in studies using subtype-specific antisera as well as by functional studies on rat parotid glands (146) and in a parotid cell line PAR-5 (147). However, binding and molecular experiments on rat, ferret and ovine submandibular glands indicate the expression of muscarinic M1 receptors, occasionally accompanied by muscarinic M5 receptors, in addition to the M3 receptors (148-153). The same observations have been made in human labial glands (154, 155). Functional significance of muscarinic M1 receptors for the secretory response has been reported, in vivo as well as in vitro, in the rabbit and ovine submandibular gland (49, 156), and in the rat sublingual (77, 102) and submandibular glands (102, 157). In this latter gland, muscarinic M5 receptors seem to contribute as well. Results from the rat sublingual and ovine submandibular glands indicate that concomitant activation of the different muscarinic receptor subtypes (M1 and M3) are a necessity for glandular maximum responses (49, 77), but the muscarinic M1 receptor seems to be of particular significance at low intensity of stimulation (49). Studies of knockout-mice support the observation that both M1 and M3 receptors contribute to the secretion evoked by cholinergic stimulation (158, 159). As mentioned, muscarinic M1 and M3 receptors generate InsP3 and causes calcium release from the endoplasmic reticulum inducing the secretory process (145); Fig. 2 indicates intracellular mechanisms in the secretion. However, diverse cellular effects by the two receptors are indicated by findings in muscarinic receptor knockout-mice. Here muscarinic M1 receptor-induced calcium signalling seems not to occur ubiquitously in submandibular acinar cells, whereas M3 receptor signalling seems to do (159). Experiments on mice knockouts suggest that muscarinic M4 and M5 receptors contribute to secretion also (160, 161). Thus, other subtypes of the muscarinic receptor than the principal secretory M3 subtype contribute to the response. Fig. 2. Acetylcholine control of fluid secretion in salivary acinar cells. Acetylcholine (ACh) binds to the G protein–linked M3 muscarinic ACh receptor (a), which causes phospholipase C to generate inositol 1,4,5-trisphosphate (InP3) (b). InP3 binds to and opens the InP3 receptor on the endoplasmic reticulum, which releases Ca2+ (c). This release of Ca2+ stimulates Ca2+ induced Ca2+ release via the InP3 receptor and the ryanodine receptor (d; cADPr cyclic ADP ribose). Increased [Ca2+]i activates the apical membrane Cl- channel (e) and the basolateral K+ channel. Efflux of Cl- into the acinar lumen draws Na+ across the cells, and the osmotic gradient generates fluid secretion (f). Nerve transmission in the parasympathetic innervation of salivary glands may be modulated by prejunctional muscarinic receptors (54, 156, 162). In rat salivary glands, muscarinic M1 receptors normally facilitate transmitter release during short, intense nerve activity. At low frequencies, on the other hand, muscarinic M2 receptors, or possibly muscarinic M4 receptors (49), inhibit cholinergic as well as peptidergic transmission, but only after some delay. Furthermore, it was first described in the feline submandibular gland that stimulation of the parasympathetic innervation in a burst pattern at high frequencies causes a conspicuous enhancement of vasodilatation and secretion in comparison with continuous stimulation (163, 164). These observations have subsequently been confirmed in salivary glands of other species (54, 162, 165, 166). The phenomenon has been attributed to the release of neuropeptides, which preferentially occurs at high stimulation frequencies (164, 165), and to a short-lasting stimulation activating prejunctional facilitator and not inhibitory receptor mechanisms (54, 162). The impact of prejunctional inhibitory muscarinic receptors can be elucidated by the fact that blockade of muscarinic autoreceptors may increase fluid responses to auriculotemporal stimulation in the rat by 200% (54). In the autoimmune disease Sjogren’s syndrome that affects salivary and lacrimal glands, a significant characteristic is salivary gland hypofunction causing xerostomia and severe effects on the oral health (167, 168). Autoantibodies against muscarinic receptors have been suggested in the disease etiology (169-171) and in animal models, such antibodies have been shown to inhibit secretion (172). Interestingly, the acinar expression of M3 receptors is increased in Sjogren’s syndrome (173) and this has been suggested to be an effect of long-term receptor blockade (174, 175). The up-regulation seems also to include the expressions of muscarinic M4 and in particular M5 receptors (155). This latter kind of subtype has been observed to be up-regulated in states of inflammation (96). While acetylcholine acting on muscarinic receptors is the principal stimulation for evoking fluid responses in salivary glands irrespectively of stimulation intensity (176), the cholinergic component has the greatest impact on the vasodilator response at low frequency stimulation (134, 177, 178). All five muscarinic receptor subtypes except the M2 have been described in vascular beds of salivary glands (49, 155), but the specific muscarinic receptor mediating vasodilatation in salivary glands has not been fully characterized. In glands of rats and sheep, endothelial cells express mainly muscarinic M1 and possibly M3 and M4 receptors, while vascular smooth muscle cells express M3 receptors (49, 155, 179). Muscarinic M5 receptors also occur, however, non-ubiquitously distributed both in the endothelium and in the smooth muscle layer. Glandular veins differ from arteries. While glandular veins express muscarinic M1 receptors in the smooth muscle, glandular arteries do not. In the rat parotid gland, cholinergic vasodilatation is mediated, at least in part, by muscarinic M3 receptors (54). In the rat submandibular gland, muscarinic M3 and M1 receptors seem to mediate the cholinergic vasodilation (179), of which a large part is NO- and endothelium-dependent (139). In the ovine submandibular gland, morphological and functional findings indicate a possible muscarinic M5 receptor involvement beside the functional muscarinic M3 receptor (49). A greater inhibitory effect of muscarinic antagonists on methacholine-induced than on parasympathetic nerve-evoked vasodilatation, could possibly be interpreted in favour of an intrinsic regulatory system (49, 155) (Fig. 3). Acetylcholine mostly evokes vasodilatation, at least in arterial blood vessels. In the venous vasculature of some organs, the transmitter may evoke constriction (180, 181), and in rat submandibular veins muscarinic M1 receptors evoke such a response (179). Muscarinic M1 receptors have been suggested to support extravasation by raising the venular hydrostatic pressure by an autocrine cholinergic mechanism (179). The extravasation has been suggested to be supported by myoepithelial cell function also. When the myoepithelial cells are stimulated, possibly induced by muscarinic stimulation (132), the tissue surrounding the cells undergoes conformation, and by the low compliance of the gland, the interstitial fluid pressure is reduced (182). Therefore, venous muscarinic M1 receptors may be of particular significance in spontaneous secreting glands, in which myoepithelial cells are not active (183). Inevitably, electrical stimulation of the parasympathetic nerve at low intensity induces vasodilatation that is largely dependent on acetylcholine (49, 87, 178). In view of the absence of reports visualizing cholinergic nerve fibres in proximity to the endothelium, the cholinergic nerve-evoked influence has been a matter of debate. However, data have accrued over recent years that other sources of acetylcholine exist besides the neuronal (117, 184, 185) and also from endothelial cells of blood vessel (186). These findings, and that all essential elements of the cholinergic system (choline acetyltranseferase (ChAT) and vesicular acetylcholine transporter) exist in the endothelium (187), could thus indicate an indirect parasympathetic vascular regulation via a non-neuronal origin of acetylcholine. Kummer and Haberberger (186) suggested, based on immunohistochemical, biochemical and functional studies, two separate cholinergic systems in the arterial vascular wall. One, an intrinsic, intimal cholinergic system serves as a regulator of basal vascular tone responding to local, luminal stimuli, whereas the other, the perivascular nerve fibres, i.e., the extrinsic, adventitial cholinergic system, acts on top of this basal tone by providing fine tuning in response to reflex activation due to systemic demands (see Fig. 3a). Parasympathetic denervation reduces ChAT activity in salivary glands (by 95% in parotids) (188), which would indicate very low amounts of non-neuronal origin of acetylcholine in the gland and that the synthesis occurs in extraglandular vessels. Fig. 3. Acetylcholine control of blood flow in a salivary gland. The schematic drawing indicates an intrinsic, intimal cholinergic system responding to local, luminal stimuli and an extrinsic, adventitial cholinergic system activated by perivascular nerve fibres (a), overall effect on glandular vessels during rest and response (b) and balance between hydrostatic and oncotic ( C) pressures during rest (upper panel) and response (lower panel; c). The gastrointestinal tract is provided with several different types of cells to fulfil its function to digest and absorb nutrients. To exemplify, the acid secretion of the stomach represents a potential threat to the epithelial layers of the stomach and the duodenum. This threat is minimized by a release of mucus and bicarbonate ions from specialized cells. The involvement of muscarinic receptors in the nervous control of these different cells is reviewed below. Acid secretion from the parietal cell represents a major function of the stomach. The secretion is controlled in a complex manner by at least three different gastric cells, the enterochromaffinlike (ECL) cells producing histamine, the G cell releasing gastrin and the D cell releasing somatostatin. Furthermore, there exists a cholinergic vagal control, which is exerted on all the mentioned cells as well as directly on the parietal cell. Histamine, gastrin and vagally released acetylcholine influence directly the production of acid from the parietal cells. Somatostatin inhibits gastrin and histamine release and, hence, acid production. Muscarinic receptors exist on all the three mentioned endocrine cells and can functionally stimulate G cells and inhibit D cells secretion (189-191). With regard to the ECL cells acetylcholine causes the release of histamine (192-194). However, whereas all ECL cells respond to gastrin with histamine release, only 10-30% of the cells respond to acetylcholine. It may reflect that only a part of the ECL cell population is vagally innervated. Functional data suggest the muscarinic receptor to be of the M1 subtype (195). Nevertheless, a muscarinic receptor activation by the release of acetylcholine from vagal nerves thus mainly leads to release of gastrin and inhibition of somatostatin release, which together with the direct muscarinic effect on the parietal cell, increase gastric acid production. Muscarinic receptors located on the parietal cells and mediating acid secretion are of the muscarinic M3 subtype possibly accompanied by the M5 subtype (196-198). The intracellular second messenger system mediating the cholinergic effect is of the “classical” type, i.e., an activation of phospholipase C and subsequent formation of InsP3 and DAG (see above). It seems less likely that the muscarinic receptors of the D cells are of the M3 subtype, since muscarinic influence on this cell inhibits the exocytosis of somatostatin. The receptor subtype involved in this muscarinic response has not been the subject of any detailed investigation. Sachs et al. (194) proposed the muscarinic receptor involved to be of the muscarinic M2 or M4 receptor subtype. The involvement of muscarinic M3 receptors in gastric acid secretion has for instance been investigated in knock-out mice (199). These animals exhibited the expected attenuation of acid secretion in response to acetylcholine. Furthermore, the mice had high plasma gastrin levels. Despite of the mucosal hypertrophy not being evident, it was suggested that the trophic effects of gastrin was mediated via a muscarinic M3 receptor. The chief cells, located in the crypts of the gastric corpus, produce a proteolytic proenzyme, pepsinogen. In an acid environment pepsinogen is activated to pepsin by the spontaneous cleavage of a small N-terminal fragment. Pepsin is important for the breakdown of protein in the ingested food. The secretion of pepsinogen is controlled, among other things, by a cholinergic, nervous influence. Vagal fibers as well as enteric nerves release acetylcholine to activate muscarinic receptors of the M1 and M3 type on the chief cells (200, 201). However, observations indicate that stimulation of vagal cholinergic nerves alone cannot evoke a pepsinogen release. Only in the presence of an acid gastric content will vagal activation lead to an enzyme release (202). In most cases the nervously evoked release of pepsinogen is accompanied by an increased gastric acid secretion. The autonomic nervous system was earlier believed to directly control the gastrointestinal smooth muscles via a release of neurotransmitter en passage from the vesicles contained in the nervous varicosities of an autonomic ground plexus. The change of membrane potential evoked by the released transmitter was proposed to spread to other smooth muscle cells via low resistant intercellular bridges (gap junctions). This has turned out to be a simplified description of the mechanisms for gastrointestinal neuromuscular control (203). Another type of cells, the interstitial cells of Cajal (ICC), has been shown to play a crucial role in the nervous control of motility, not the least for the muscarinic control (204). ICC are partly located between the circular and longitudinal muscle layers at the level of the myenteric plexus. This part of ICC is named ICC-MY. Other ICC, named ICC-IM, are located within the gastric smooth muscle layer in an intimate relationship with enteric nerve terminals. In the small intestine the ICC are also located at the deep muscular plexus, named ICC-DMP, which seems to correspond to ICC-IM in the stomach. Ultrastructural and biochemical studies have demonstrated synapse-like specializations (so called membrane densifications) between enteric nerve terminals and ICC-IM/ICC-DMP (205). In all probability, these structures mediate the nervous influence on ICC and, thus, the nervous motility control. They are localized between enteric nerves and ICC, but not between enteric nerves and smooth muscle cells. ICC are of importance in integrating intestinal motor responses such as peristalsis. The propulsive effect of this rather complex nervous motor reflex is evoked by a contraction at the site of the food bolus and a relaxation distal to it. ICC-IM and ICC-DMP are essential for the cholinergic and tachykinin excitatory motor control of gastrointestinal smooth muscles and seem also to be provided with receptors for VIP and to be sensitive to NO, the inhibitory transmitters of peristalsis (206, 207). A picture thus emerges in which the receptors located on ICC-IM/ICC-DMP may be more important than the receptors at the cell membrane of the smooth muscle cells. Thus, ICC integrate on the gastrointestinal smooth muscles the ongoing influence of the different neurotransmitters underlying peristalsis. The importance of ICC for the cholinergic motility control has been studied in some detail. Using W/Wv mice lacking ICC in the gastric muscle layer, it was convincingly demonstrated that cholinergic control of gastrointestinal smooth muscles cannot occur in the absence of ICC (206, 208). Similar results were obtained when disrupting ICC-DMP by treating neonatal rats with antibodies to Kit, a tyrosine kinase receptor (209, 210). The subtype of muscarinic receptor involved in the contractile response of the gastrointestinal smooth muscle has been investigated both at the mRNA and protein level. The studies revealed that both M2 and M3 receptors are present (211, 212). Furthermore, activation of muscarinic M1 receptors evokes a gastric smooth muscle relaxation in M3 knock-out mice via a NO-mediated mechanism (213, 214). Muscarinic receptors are also indirectly involved in the sympathetic control of gastrointestinal smooth muscles (215). Early physiological studies indicated that the gastrointestinal muscle layers were innervated by parasympathetic cholinergic excitatory and sympathetic adrenergic inhibitory nerve fibers. By the use of histochemical studies, developed around the middle of the 20th century, it was shown that the direct sympathetic innervation of gastrointestinal smooth muscles was very scarce (216-218). Most of the adrenergic nerve fibers made contact with the neurons of the myenteric and submucous plexuses. Hence, a pre-requisite for a sympathetic inhibitory influence on gastrointestinal smooth muscle function is that there is an ongoing activity in cholinergic parasympathetic neurons influencing muscarinic receptors. The gastroduodenal epithelium secretes bicarbonate ions, which together with mucus form an alkaline layer of great importance for the protection of the epithelium from the acid contents in the stomach and in the duodenum. A major part of the studies reviewed below was performed on the duodenal bicarbonate secretion. The presence of a muscarinic receptor control of bicarbonate secretion has been demonstrated repeatedly. Intravascularly or subcutaneously administered muscarinic agonists increase bicarbonate release into the intestinal lumen (219) a response blocked by muscarinic antagonists (218, 220). Furthermore, giving atropine during “resting” conditions attenuated bicarbonate secretion in most studies (221, 222), indicating an ongoing “background” muscarinic activation of bicarbonate secretion. Most of the studies of the nervous bicarbonate control have been performed in three different experimental situations. First, electrical stimulation of vagal fibers augments bicarbonate secretion (221). Muscarinic receptors may be involved in this response but the experimental evidence is contradictory. Jonson et al. (222) failed to influence the vagal effect with atropine, whereas Glad et al. (220, 223-225) reported an inhibition. Second, bicarbonate secretion both in the stomach and in the duodenum is increased after sham feeding (223). There are conflicting results as to what extent this response is mediated by muscarinic receptors. According to Forssell et al. (220) the sham feeding response is diminished by a muscarinic receptor antagonist. Ballesteros et al. (220) failed to confirm this observation. Both studies were performed on humans. Third, exposing the duodenal mucosa to acid evokes a nervously mediated bicarbonate secretion. This is not influenced by atropine (219). To summarize, there is a nervous control of bicarbonate secretion but the experimental evidence for an involvement of muscarinic receptors is not yet clearly demonstrated. Three reports have attempted to determine which type of muscarinic receptor that is localized to the bicarbonate secreting cells utilizing different pharmacological blockers. Takeuchi et al. (218) and Safsten et al. (226) working on rats proposed that the receptor was of the M2 and the M1 subtype, respectively. Larsen et al. (227, 228) using human material concluded that the receptor was of the M3 subtype. The different results probably reflect that the different receptor antagonists used are not specific enough to provide a clear answer and species differences may also exist. Intestinal fluid transport is of great physiological and pathophysiological importance. A net fluid secretion can be life threatening. Absorption of water occurs across the villus epithelium and is driven by a hyperosmolar compartment in the villus lamina propria mainly made up by sodium chloride (229). Fluid is secreted from the crypts presumably mediated by an active chloride secretion (230). The nervous control of fluid transport is directed towards a control of electrolyte and fluid secretion in the intestinal crypts. Immunohistochemical investigations have revealed a large number of mucosal nerves containing established and putative neurotransmitters including acetylcholine (231). Experimental observations have demonstrated that both extrinsic sympathetic and parasympathetic as well as intrinsic enteric nerves influence fluid transport. Stimulation of the sympathetic nerves to the gut increases intestinal fluid uptake by attenuating crypt secretion (230). Nerves containing ChAT and, hence, presumably also acetylcholine, are abundant in the gastrointestinal tract. More than 40% of the efferent submucosal neurons contain ChAT (232-234). A vagal, secretory influence on fluid transport in the small intestine exists but it seems not to involve acetylcholine as a neurotransmitter (235) but probably VIP (236, 237). On the other hand, pelvic nerve stimulation causes a secretion from the cat colon, which can be blocked by atropine (238, 239). In line with this, muscarinic receptors have been demonstrated on colonic enterocytes (240-242). Although stimulation of extrinsic nerves to the small intestine fails to evoke a muscarinic secretory response, muscarinic receptors on enterocytes have been demonstrated also in the small bowel (243). Furthermore, experimental observations in vitro clearly suggest that acetylcholine is a transmitter at the secreting enterocyte in the small intestine. Thus, atropine markedly attenuates the increase of short circuit current (SCC) across the intestinal wall evoked by electrical field stimulation in vitro. Furthermore, muscarinic agonists mimic this response (for references, see (232)). Finally, atropine enhances fluid uptake from the cat small intestine in vivo or turns spontaneous secretion to fluid absorption (244). Taken together these observations indicate that certain intramural nerves may control the muscarinic receptors involved in fluid transport. In line with this, Mellander et al. (245) reported that the fluid secretion accompanying the migrating myoelectric complex might be mediated via muscarinic receptors. It is likely that a net secretion of chloride ions in the intestinal crypts drives the cholinergic fluid secretion. On the other hand, in extensive studies of different types of acute diarrhoea in anesthetized rats (e.g., cholera toxin and bile salt) atropine failed to attenuate the evoked fluid secretion although the agents clearly cause secretion via enteric nerves (for references see, (246, 247)). A few studies exist on which subtype of muscarinic receptor is involved in the control of colonic crypt secretion. In pharmacological analyses of which muscarinic receptor subtypes involved in regulation of colononic secretion, studies have been performed on the cholinergic control of enterocyte [Ca2+]i. The studies indicate that the muscarinic M3 receptor is probably the most important receptor type (248-254). In line with this, we have shown that muscarinic M1, M3 and M5 receptors are present on enterocytes, whereas we were unable to demonstrate the existence of muscarinic M2 and M4 receptors (Lundgren et al., unpublished observations, 2008). A mucus layer is covering the intestinal epithelial cells to protect the cells from the luminal contents. Mucus is produced by and secreted from the so-called goblet cells that are found both on villi and in crypts. Goblet secretion is influenced by a cholinergic mechanism as shown by muscarinic agonists and antagonists (255). In the colon there seems to be a cholinergic control of mucus secretion in the crypts but not on the mucosal surface (249).Whereas electrical field stimulation evokes a release of mucus (256), stimulation of the parasympathetic (vagal) nerves to the small intestine fails to do so (251, 252). These observations suggest, as in the case of intestinal fluid transport, that intrinsic enteric cholinergic nerves control goblet cells. Several observations support this conclusion. Cholera toxin in the intestinal lumen evokes mucus secretion via nerves. This effect is abolished by neonatal administration of capsaicin suggesting that the nervous cholera toxin effect is exerted via a so-called axon reflex (257, 258), as also proposed for the cholinergic control of intestinal stem/progenitor cells. To our knowledge, no investigation has been published of which subtype of muscarinic receptor that is present on intestinal goblet cells. In the conjunctiva the goblet cells are provided with muscarinic receptors of the M1, M2 and M3 subtypes (254), possibly implying that the same receptors are present on the intestinal goblet cells. Activation of the muscarinic receptor in the conjunctiva transactivates the EGF receptor leading to an activation of MAP kinase (259), as has also been proposed for the nervous control of intestinal stem/progenitor cells. The renewal rate of the intestinal epithelium is very fast, being 2-5 days. This is accomplished by means of the epithelial stem/progenitor cells located deep in the intestinal crypts, constantly reproducing themselves. A nervous control of rate of cell renewal has been inferred by Bjerknes & Cheng (260) based on the observation that the increasing effect of glucagon-like peptide 1 on the intestinal stem/progenitor cells was blocked by tetrodotoxin. Recent observations by Lundgren et al. (manuscript submitted) clearly indicate, however, that neurons controlling the stem/progenitor cells are cholinergic. The muscarinic receptor involved has not been definitely established but the observations indicate that it is not of the M1 or M4 subtypes. Paneth cells are located at the very bottom of the intestinal crypts. During physiological conditions they are only found in the small intestine. The cells produce bacteriocide peptides often collectively named defensins. It is known since long that cholinergic agonists cause a degranulation of Paneth cells (261-264). More recent investigations have confirmed the muscarinic control of defensin release (265), showing a blocking effect of atropine. The subtype of muscarinic receptor involved is not known. In the alimentary tract, almost every function involves muscarinic receptor effects (Fig. 4 indicates a principle scheme of cholinergic signalling). However, the pattern of heterogeneity of the receptor population varies in tissues. The population in glandular parenchymal tissue often consists of a mixture of M1 and M3 receptors, in smooth muscle tissue of the gut of M2 and M3 subtypes, in blood vessels of M1, M3, M4 and M5 and on neuronal cells of M1 and M4 subtypes. NO production, effects on inflammation and proliferation may involve muscarinic M1, M3 and M5 receptors. Fig. 4. Suggested principal effects by muscarinic receptor subtypes. Postjunctionally, muscarinic M3 receptors activate intracellular pathways evoking secretion and contraction, while muscarinic M2 receptors inhibit counteracting stimuli. Prejunctionally, muscarinic M1 and M4 receptors facilitate and inhibit transmitter release, respectively. Indirect effects, often by non-neuronal and intrinsic systems, often include effects by muscarinic M1, M4 and M5 receptors. Stimulatory effects are indicated by arrows and inhibitory effects by lines with a round ending. In salivary glands of different species including man, muscarinic M1 receptors seem to occur co-localized with muscarinic M3 receptors on secretory cells, preferentially in sero-mucous/mucous glands, and co-activation of M1 and the M3 receptors may be a pre-requisite for maximum responses. Vasodilatation may be affected by muscarinic receptors as well. While muscarinic M1, M3 and possibly M5 receptors cause vasodilatation NO-dependently, venous muscarinic M1 receptors may promote fluid recruitment from blood vessels into glandular tissue by venous contractile effects. In the gastrointestinal tract, acetylcholine evokes gastric acid secretion via muscarinic M3 receptors, while both M1 and M3 receptors may be involved in pepsinogen secretion. Muscarinic M2 receptor may interact positively with M3 receptors in the contractile intestinal responses, particularly during inflammation, while M1 receptors evoke relaxation by a NO-dependent mechanism. Muscarinic M3 but also M1 receptors may be involved in the secretory responses. In addition to the contractile and secretory effects, muscarinic receptors may have an important role in nervous control of renewal rate of the intestinal epithelium. The subtypes affecting epithelial stem/progenitor cells activation are likely to be of M3 or/and M5 subtype. Uchiyama T, Chess-Williams R. Muscarinic receptor subtypes of the bladder and gastrointestinal tract. J Smooth Muscle Res 2004; 40(6): 237-247. Lecci A, Santicioli P, Maggi CA. Pharmacology of transmission to gastrointestinal muscle. Curr Opin Pharmacol 2002; 2(6): 630-641. Tobin G. Salivary secretion control. In: Encyclopedia of Neuroscience, MD Binder, N Hirokawa, U Windhorst, MC Hirsch (eds). Springer; 2008. Caulfield MP, Birdsall NJ. International Union of Pharmacology. XVII. Classification of muscarinic acetylcholine receptors. Pharmacol Rev 1998; 50(2): 279-290. Eglen RM. Muscarinic receptor subtypes in neuronal and non-neuronal cholinergic function. Auton Autacoid Pharmacol 2006; 26(3): 219-233. Kubo T, Fukuda K, Mikami A et al. Cloning, sequencing and expression of complementary DNA encoding the muscarinic acetylcholine receptor. Nature 1986; 323(6087): 411-416. Hulme EC. Muscarinic acetylcholine receptors: typical G-coupled receptors. Symp Soc Exp Biol 1990; 44: 39-54. Hulme EC, Birdsall NJ, Buckley NJ. Muscarinic receptor subtypes. Annu Rev Pharmacol Toxicol 1990; 30: 633-673. Caulfield MP. Muscarinic receptors—characterization, coupling and function. Pharmacol Ther 1993; 58(3): 319-379. Goyal RK. Identification, localization and classification of muscarinic receptor subtypes in the gut. Life Sci 1988; 43(26): 2209-2220. Unno T, Matsuyama H, Izumi Y, Yamada M, Wess J, Komori S. Roles of M2 and M3 muscarinic receptors in cholinergic nerve-induced contractions in mouse ileum studied with receptor knockout mice. Br J Pharmacol 2006; 149(8): 1022-1030. Somogyi GT, de Groat WC. Function, signal transduction mechanisms and plasticity of presynaptic muscarinic receptors in the urinary bladder. Life Sci 1999; 64(6-7): 411-418. Casanova MF, Trippe J, 2nd. Regulatory mechanisms of cortical laminar development. Brain Res Rev 2006; 51(1): 72-84. Ventura S, Pennefather J, Mitchelson F. Cholinergic innervation and function in the prostate gland. Pharmacol Ther 2002; 94(1-2): 93-112. Ukegawa JI, Takeuchi Y, Kusayanagi S, Mitamura K. Growth-promoting effect of muscarinic acetylcholine receptors in colon cancer cells. J Cancer Res Clin Oncol 2003; 129(5): 272-278. Profita M, Giorgi RD, Sala A et al. Muscarinic receptors, leukotriene B4 production and neutrophilic inflammation in COPD patients. Allergy 2005; 60(11): 1361-1369. Racke K, Juergens UR, Matthiesen S. Control by cholinergic mechanisms. Eur J Pharmacol 2006; 533(1-3): 57-68. Kawashima K, Fujii T. Expression of non-neuronal acetylcholine in lymphocytes and its contribution to the regulation of immune function. Front Biosci 2004; 9: 2063-2085. Lanzafame AA, Christopoulos A, Mitchelson F. Cellular signaling mechanisms for muscarinic acetylcholine receptors. Receptors Channels 2003; 9(4): 241-260. Gudermann T, Kalkbrenner F, Schultz G. Diversity and selectivity of receptor-G protein interaction. Annu Rev Pharmacol Toxicol 1996; 36: 429-459. Wu G, Bogatkevich GS, Mukhin YV, Benovic JL, Hildebrandt JD, Lanier SM. Identification of Gbetagamma binding sites in the third intracellular loop of the M(3)-muscarinic receptor and their role in receptor regulation. J Biol Chem 2000; 275(12): 9026-9034. Zholos AV, Zholos AA, Bolton TB. G-protein-gated TRP-like cationic channel activated by muscarinic receptors: effect of potential on single-channel gating. J Gen Physiol 2004; 123(5): 581-598.
van Koppen CJ, Kaiser B. Regulation of muscarinic acetylcholine receptor signaling. Pharmacol Ther 2003; 98(2): 197-220. Lucas JL, Wang D, Sadee W. Calmodulin binding to peptides derived from the i3 loop of muscarinic receptors. Pharm Res 2006; 23(4): 647-653. Eglen RM, Nahorski SR. The muscarinic M(5) receptor: a silent or emerging subtype? Br J Pharmacol 2000; 130(1): 13-21. Schmidt M, Voss M, Weernink PA, Wetzel J, Amano M, Kaibuchi K et al. A role for rho-kinase in rho-controlled phospholipase D stimulation by the m3 muscarinic acetylcholine receptor. J Biol Chem 1999; 274(21): 14648-14654. Hall A. G proteins and small GTPases: distant relatives keep in touch. Science 1998; 280(5372): 2074-2075. Sakai H, Hirano T, Takeyama H, Chiba Y, Misawa M. Acetylcholine-induced phosphorylation of CPI-17 in rat bronchial smooth muscle: the roles of Rho-kinase and protein kinase C. Can J Physiol Pharmacol 2005; 83(4): 375-381. Chiba Y, Misawa M. The role of RhoA-mediated Ca2+ sensitization of bronchial smooth muscle contraction in airway hyperresponsiveness. J Smooth Muscle Res 2004; 40(4-5): 155-167. Kimura K, Ito M, Amano M, Chihara K, Fukata Y, Nakafuku M et al. Regulation of myosin phosphatase by Rho and Rho-associated kinase (Rho-kinase). Science 1996; 273(5272): 245-248. Matthiesen S, Bahulayan A, Holz O, Racke K. MAPK pathway mediates muscarinic receptor-induced human lung fibroblast proliferation. Life Sci 2007; 80(24-25): 2259-2262. Rossignol TM, Jones SV. Regulation of a family of inwardly rectifying potassium channels (Kir2) by the m1 muscarinic receptor and the small GTPase Rho. Pflugers Arch 2006; 452(2): 164-174. Roberson ED, English JD, Adams JP, Selcher JC, Kondratick C, Sweatt JD. The mitogen-activated protein kinase cascade couples PKA and PKC to cAMP response element binding protein phosphorylation in area CA1 of hippocampus. J Neurosci 1999; 19(11): 4337-4348. Lin K, Wang D, Sadee W. Serum response factor activation by muscarinic receptors via RhoA. Novel pathway specific to M1 subtype involving calmodulin, calcineurin, and Pyk2. J Biol Chem 2002; 277(43): 40789-40798.
van Koppen CJ, Meyer zu Heringdorf D, Alemany R, Jakobs KH. Sphingosine kinase-mediated calcium signaling by muscarinic acetylcholine receptors. Life Sci 2001; 68(22-23): 2535-2540. Meyer zu Heringdorf D, Lass H, Alemany R, Laser KT, Neumann E, Zhang C et al. Sphingosine kinase-mediated Ca2+ signalling by G-protein-coupled receptors. Embo J 1998; 17(10): 2830-2837. Itagaki K, Hauser CJ. Sphingosine 1-phosphate, a diffusible calcium influx factor mediating store-operated calcium entry. J Biol Chem 2003; 278(30): 27540-27547. Pfaff M, Powaga N, Akinci S, Schutz W, Banno Y, Wiegand S et al. Activation of the SPHK/S1P signalling pathway is coupled to muscarinic receptor-dependent regulation of peripheral airways. Respir Res 2005; 6: 48. Re L. Modulation of acetylcholine release by presynaptic muscarinic autoreceptors. Acta Physiol Pharmacol Ther Latinoam 1999; 49(4): 215-223. Grimm U, Moser U, Mutschler E, Lambrecht G. Muscarinic receptors: focus on presynaptic mechanisms and recently developed novel agonists and antagonists. Pharmazie 1994; 49(10): 711-726. Khanin R, Parnas I, Parnas H. On the feedback between theory and experiment in elucidating the molecular mechanisms underlying neurotransmitter release. Bull Math Biol 2006; 68(5): 997-1009. Langer SZ. 25 years since the discovery of presynaptic receptors: present knowledge and future perspectives. Trends Pharmacol Sci 1997; 18(3): 95-99. Kilbinger H, Dietrich C, von Bardeleben RS. Functional relevance of presynaptic muscarinic autoreceptors. J Physiol Paris 1993; 87(2): 77-81. Slutsky I, Wess J, Gomeza J, Dudel J, Parnas I, Parnas H. Use of knockout mice reveals involvement of M2-muscarinic receptors in control of the kinetics of acetylcholine release. J Neurophysiol 2003; 89(4): 1954-1967. Alberts P. Classification of the presynaptic muscarinic receptor subtype that regulates 3H-acetylcholine secretion in the guinea pig urinary bladder in vitro. J Pharmacol Exp Ther 1995; 274(1): 458-468. Zhou H, Meyer A, Starke K, Gomeza J, Wess J, Trendelenburg AU. Heterogeneity of release-inhibiting muscarinic autoreceptors in heart atria and urinary bladder: a study with M(2)- and M(4)-receptor-deficient mice. Naunyn Schmiedebergs Arch Pharmacol 2002; 365(2): 112-122. D’Agostino G, Barbieri A, Chiossa E, Tonini M. M4 muscarinic autoreceptor-mediated inhibition of -3H-acetylcholine release in the rat isolated urinary bladder. J Pharmacol Exp Ther 1997; 283(2): 750-756. D’Agostino G, Bolognesi ML, Lucchelli A, Vicini D, Balestra B, Spelta V et al. Prejunctional muscarinic inhibitory control of acetylcholine release in the human isolated detrusor: involvement of the M4 receptor subtype. Br J Pharmacol 2000; 129(3): 493-500. Tobin G, Ryberg AT, Gentle S, Edwards AV. Distribution and function of muscarinic receptor subtypes in the ovine submandibular gland. J Appl Physiol 2006; 100(4): 1215-1223. Tobin G, Sjogren C. in vivo and in vitro effects of muscarinic receptor antagonists on contractions and release of [3H]acetylcholine in the rabbit urinary bladder. Eur J Pharmacol 1995; 281(1): 1-8. Tobin G, Sjogren C. Prejunctional facilitatory and inhibitory modulation of parasympathetic nerve transmission in the rabbit urinary bladder. J Auton Nerv Syst 1998; 68(3): 153-156. Somogyi GT, Tanowitz M, de Groat WC. M1 muscarinic receptor-mediated facilitation of acetylcholine release in the rat urinary bladder. J Physiol 1994; 480: 81-89. Kortezova N, Shikova L, Papasova M. Participation of M1 receptors in NO pathway in cat ileum. Acta Physiol Pharmacol Bulg 1998; 23(1): 1-4. Tobin G. Presynaptic muscarinic M1 and M2 receptor modulation of auriculotemporal nerve transmission in the rat. J Auton Nerv Syst 1998; 72(1): 61-71. Slutsky I, Parnas H, Parnas I. Presynaptic effects of muscarine on ACh release at the frog neuromuscular junction. J Physiol 1999; 514: 769-782. Slutsky I, Rashkovan G, Parnas H, Parnas I. Ca2+-independent feedback inhibition of acetylcholine release in frog neuromuscular junction. J Neurosci 2002; 22(9): 3426-3433. Kimura F, Baughman RW. Distinct muscarinic receptor subtypes suppress excitatory and inhibitory synaptic responses in cortical neurons. J Neurophysiol 1997; 77(2): 709-716. Nikbakht MR, Stone TW. Occlusive responses to adenosine A1 receptor and muscarinic M2 receptor activation on hippocampal presynaptic terminals. Brain Res 1999; 829(1-2): 193196. Fernandez-Fernandez JM, Abogadie FC, Milligan G, Delmas P, Brown DA. Multiple pertussis toxin-sensitive G-proteins can couple receptors to GIRK channels in rat sympathetic neurons when expressed heterologously, but only native G(i)-proteins do so in situ. Eur J Neurosci 2001; 14(2): 283-292. Eltze M, Galvan M. Involvement of muscarinic M2 and M3, but not of M1 and M4 receptors in vagally stimulated contractions of rabbit bronchus/trachea. Pulm Pharmacol 1994; 7(2): 109-120. Scholz KP, Miller RJ. Inhibition of quantal transmitter release in the absence of calcium influx by a G protein-linked adenosine receptor at hippocampal synapses. Neuron 1992; 8(6): 1139-1150. Grillner P, Bonci A, Svensson TH, Bernardi G, Mercuri NB. Presynaptic muscarinic (M3) receptors reduce excitatory transmission in dopamine neurons of the rat mesencephalon. Neuroscience 1999; 91(2): 557-565. Oliveira L, Correia-de-Sa P. Protein kinase A and Ca(v)1 (L-type) channels are common targets to facilitatory adenosine A2A and muscarinic M1 receptors on rat motoneurons. Neurosignals 2005; 14(5): 262-272. Santafe MM, Lanuza MA, Garcia N, Tomas J. Muscarinic autoreceptors modulate transmitter release through protein kinase C and protein kinase A in the rat motor nerve terminal. Eur J Neurosci 2006; 23(8): 2048-2056. Abrams P, Andersson KE, Buccafusco JJ, Chapple C, de Groat WC, Fryer AD et al. Muscarinic receptors: their distribution and function in body systems, and the implications for treating overactive bladder. Br J Pharmacol 2006; 148(5): 565-578. Eglen RM. Muscarinic receptors and gastrointestinal tract smooth muscle function. Life Sci 2001; 68: 2573-2578. Eglen RM. Muscarinic receptor subtype pharmacology and physiology. Prog Med Chem 2005; 43: 105-136. Eglen RM, Hegde SS, Watson N. Muscarinic receptor subtypes and smooth muscle function. Pharmacol Rev 1996; 48(4): 531-565. Ehlert FJ. Contractile role of M2 and M3 muscarinic receptors in gastrointestinal, airway and urinary bladder smooth muscle. Life Sci 2003; 74: 355-366. Kume H, Mikawa K, Takagi K, Kotlikoff MI. Role of G proteins and KCa channels in the muscarinic and beta-adrenergic regulation of airway smooth muscle. Am J Physiol 1995; 268: L221-L229. Kotlikoff MI, Wang YX. Calcium release and calcium-activated chloride channels in airway smooth muscle cells. Am J Respir Crit Care Med 1998; 158: S109-S114. Zholos AV. Regulation of TRP-like muscarinic cation current in gastrointestinal smooth muscle with special reference to PLC/InsP3/Ca2+ system. Acta Pharmacol Sin 2006; 27(7): 833-842.
vom Dorp F, Sari AY, Sanders H, Keiper M, Oude Weernink PA, Jakobs KH et al. Inhibition of phospholipase C-epsilon by Gi-coupled receptors. Cell Signal 2004; 16(8): 921-928. Sakamoto T, Unno T, Matsuyama H, Uchiyama M, Hattori M, Nishimura M et al. Characterization of muscarinic receptor-mediated cationic currents in longitudinal smooth muscle cells of mouse small intestine. J Pharmacol Sci 2006; 100(3): 215-226. Sakamoto T, Unno T, Kitazawa T, Taneike T, Yamada M, Wess J et al. Three distinct muscarinic signalling pathways for cationic channel activation in mouse gut smooth muscle cells. J Physiol 2007; 582: 41-61. Kotlikoff MI, Dhulipala P, Wang YX. M2 signaling in smooth muscle cells. Life Sci 1999; 64: 437-442. Culp DJ, Luo W, Richardson LA, Watson GE, Latchney LR. Both M1 and M3 receptors regulate exocrine secretion by mucous acini. Am J Physiol 1996; 271: C1963-C1972. Berkeley JL, Gomeza J, Wess J, Hamilton SE, Nathanson NM, Levey AI. M1 muscarinic acetylcholine receptors activate extracellular signal-regulated kinase in CA1 pyramidal neurons in mouse hippocampal slices. Mol Cell Neurosci 2001; 18(5): 512-524. Hamilton SE, Nathanson NM. The M1 receptor is required for muscarinic activation of mitogen-activated protein (MAP) kinase in murine cerebral cortical neurons. J Biol Chem 2001; 276(19): 15850-15853. Bandyopadhyay BC, Swaim WD, Liu X, Redman RS, Patterson RL, Ambudkar IS. Apical localization of a functional TRPC3/TRPC6-Ca2+-signaling complex in polarized epithelial cells. Role in apical Ca2+ influx. J Biol Chem 2005; 280(13): 12908-12916. Beech DJ. TRPC1: store-operated channel and more. Pflugers Arch 2005; 451(1): 53-60. Kim JY, Saffen D. Activation of M1 muscarinic acetylcholine receptors stimulates the formation of a multiprotein complex centered on TRPC6 channels. J Biol Chem 2005; 280(36): 32035-32047. Pemberton KE, Hill-Eubanks LJ, Jones SV. Modulation of low-threshold T-type calcium channels by the five muscarinic receptor subtypes in NIH 3T3 cells. Pflugers Arch 2000; 440(3): 452-461. Durand S, Tartas M, Bouye P, Koitka A, Saumet JL, Abraham P. Prostaglandins participate in the late phase of the vascular response to acetylcholine iontophoresis in humans. J Physiol 2004; 561: 811-819. Furchgott RF. Endothelium-derived relaxing factor: discovery, early studies, and identification as nitric oxide. Biosci Rep 1999; 19(4): 235-251. Stojic D, Radenkovic M, Krsljak E, Popovic J, Pesic S, Grbovic L. Influence of the endothelium on the vasorelaxant response to acetylcholine and vasoactive intestinal polypeptide in the isolated rabbit facial artery. Eur J Oral Sci 2003; 111(2): 137-143. Anderson LC, Garrett JR. Neural regulation of blood flow in the rat submandibular gland. Eur J Morphol 1998; 36 Suppl: 213-218.
de Groat WC. Integrative control of the lower urinary tract: preclinical perspective. Br J Pharmacol 2006; 147 Suppl 2: S25-S40. Andersson KE, Persson K. Nitric oxide synthase and nitric oxide-mediated effects in lower urinary tract smooth muscles. World J Urol 1994; 12(5): 274-280. Schachter M, Matthews B, Bhoola KD. Evidence that nitric oxide or a related substance is a neurovasodilator in the submandibular gland of the cat. Agents Actions Suppl 1992; 38 (Pt 2): 366-370. Feddersen CO, Mathias MM, McMurtry IF, Voelkel NF. Acetylcholine induces vasodilation and prostacyclin synthesis in rat lungs. Prostaglandins 1986; 31(5): 973-987. Berra A, Ganzinelli S, Saravia M, Borda E, Sterin-Borda L. Inducible nitric oxide synthase subserves cholinergic vasodilation in retina. Vis Neurosci 2005; 22(3): 371-377. Borda E, Berra A, Saravia M, Ganzinelli S, Sterin-Borda L. Correlations between neuronal nitric oxide synthase and muscarinic M3/M1 receptors in the rat retina. Exp Eye Res 2005; 80(3): 391-399. Elhusseiny A, Hamel E. Muscarinic—but not nicotinic—acetylcholine receptors mediate a nitric oxide-dependent dilation in brain cortical arterioles: a possible role for the M5 receptor subtype. J Cereb Blood Flow Metab 2000; 20(2): 298-305. Sterin-Borda L, Ganzinelli S, Berra A, Borda E. Novel insight into the mechanisms involved in the regulation of the m1 muscarinic receptor, iNOS and nNOS mRNA levels. Neuropharmacology 2003; 45(2): 260-269. Giglio D, Ryberg AT, To K, Delbro DS, Tobin G. Altered muscarinic receptor subtype expression and functional responses in cyclophosphamide induced cystitis in rats. Auton Neurosci 2005; 122: 9-20. Wang SZ, Lee SY, Zhu SZ, Wotta DR, Parsons AM, el-Fakahany EE. Activation of neuronal nitric oxide synthase by M2 muscarinic receptors associated with a small increase in intracellular calcium. Pharmacology 1997; 55(1): 10-17. Alm P, Ekstrom J, Larsson B, Tobin G, Andersson KE. Nitric oxide synthase immunoreactive nerves in rat and ferret salivary glands, and effects of denervation. Histochem J 1997; 29(9): 669-676. Soinila J, Nuorva K, Soinila S. Nitric oxide synthase in human salivary glands. Histochem Cell Biol 2006; 125(6): 717-723. Proctor GB, Carpenter GH. Regulation of salivary gland function by autonomic nerves. Auton Neurosci 2007; 133(1): 3-18. Shimomura H, Tanaka S, Komine N, Shimooka S, Imai A, Nashida T. Soluble guanylyl cyclase is localised in the acinar cells and participates in amylase secretion in rat parotid gland. Arch Oral Biol 2004; 49(9): 691-696. Tobin G, Giglio D, Gotrick B. Studies of muscarinic receptor subtypes in salivary gland function in anaesthetized rats. Auton Neurosci 2002; 100: 1-9. Looms D, Tritsaris K, Pedersen AM, Nauntofte B, Dissing S. Nitric oxide signalling in salivary glands. J Oral Pathol Med 2002; 31(10): 569-584. Rosignoli F, Perez Leiros C. Activation of nitric oxide synthase through muscarinic receptors in rat parotid gland. Eur J Pharmacol 2002; 439: 27-33. Lomniczi A, Suburo AM, Elverdin JC, Mastronardi CA, Diaz S, Rettori V et al. Role of nitric oxide in salivary secretion. Neuroimmunomodulation 1998; 5(5): 226-233. Soinila S, Vanhatalo S, Lumme A, Back N, Soinila J. Nitric oxide synthase in the autonomic and sensory ganglia innervating the submandibular salivary gland. Microsc Res Tech 1996; 35(1): 32-43. Ohama T, Hori M, Ozaki H. Mechanism of abnormal intestinal motility in inflammatory bowel disease: how smooth muscle contraction is reduced? J Smooth Muscle Res 2007; 43(2): 43-54. Pavlov VA, Tracey KJ. Controlling inflammation: the cholinergic anti-inflammatory pathway. Biochem Soc Trans 2006; 34: 1037-1040. Brunn G, Wessler I, Racke K. Mucosa-dependent muscarinic liberation of prostaglandins from rat isolated trachea. Br J Pharmacol 1995; 116(3): 1991-1998. Koyama S, Rennard SI, Robbins RA. Acetylcholine stimulates bronchial epithelial cells to release neutrophil and monocyte chemotactic activity. Am J Physiol 1992; 262: L466-L471. Mita Y, Dobashi K, Suzuki K, Mori M, Nakazawa T. Induction of muscarinic receptor subtypes in monocytic/macrophagic cells differentiated from EoL-1 cells. Eur J Pharmacol 1996; 297: 121-127. Gosens R, Bos IS, Zaagsma J, Meurs H. Protective effects of tiotropium bromide in the progression of airway smooth muscle remodeling. Am J Respir Crit Care Med 2005; 171(10): 1096-1102. Frucht H, Jensen RT, Dexter D, Yang WL, Xiao Y. Human colon cancer cell proliferation mediated by the M3 muscarinic cholinergic receptor. Clin Cancer Res 1999; 5(9): 2532-2539. Yang WL, Frucht H. Cholinergic receptor up-regulates COX-2 expression and prostaglandin E(2) production in colon cancer cells. Carcinogenesis 2000; 21(10): 1789-1793. Metzen J, Bittinger F, Kirkpatrick CJ, Kilbinger H, Wessler I. Proliferative effect of acetylcholine on rat trachea epithelial cells is mediated by nicotinic receptors and muscarinic receptors of the M1-subtype. Life Sci 2003; 72: 2075-2080. Wessler I, Kirkpatrick CJ, Racke K. Non-neuronal acetylcholine, a locally acting molecule, widely distributed in biological systems: expression and function in humans. Pharmacol Ther 1998; 77(1): 59-79. Wessler IK, Kirkpatrick CJ. The Non-neuronal cholinergic system: an emerging drug target in the airways. Pulm Pharmacol Ther 2001; 14(6): 423-434. Reinheimer T, Baumgartner D, Hohle KD, Racke K, Wessler I. Acetylcholine via muscarinic receptors inhibits histamine release from human isolated bronchi. Am J Respir Crit Care Med 1997; 156: 389-395. Klapproth H, Reinheimer T, Metzen J, Munch M, Bittinger F, Kirkpatrick CJ et al. Non-neuronal acetylcholine, a signalling molecule synthezised by surface cells of rat and man. Naunyn Schmiedebergs Arch Pharmacol 1997; 355(4): 515-523. Reinheimer T, Mohlig T, Zimmermann S, Hohle KD, Wessler I. Muscarinic control of histamine release from airways. Inhibitory M1-receptors in human bronchi but absence in rat trachea. Am J Respir Crit Care Med 2000; 162: 534-538. Zia S, Ndoye A, Nguyen VT, Grando SA. Nicotine enhances expression of the alpha 3, alpha 4, alpha 5, and alpha 7 nicotinic receptors modulating calcium metabolism and regulating adhesion and motility of respiratory epithelial cells. Res Commun Mol Pathol Pharmacol 1997; 97(3): 243-262. Budd DC, McDonald J, Emsley N, Cain K, Tobin AB. The C-terminal tail of the M3-muscarinic receptor possesses anti-apoptotic properties. J Biol Chem 2003; 278(21): 19565-19573. Laszlo GS, Rosoff ML, Amieux PS, Nathanson NM. Multiple promoter elements required for leukemia inhibitory factor-stimulated M2 muscarinic acetylcholine receptor promoter activity. J Neurochem 2006; 98(4): 1302-1315. Krymskaya VP, Orsini MJ, Eszterhas AJ, Brodbeck KC, Benovic JL, Panettieri RA, Jr. et al. Mechanisms of proliferation synergy by receptor tyrosine kinase and G protein-coupled receptor activation in human airway smooth muscle. Am J Respir Cell Mol Biol 2000; 23(4): 546-554. Gosens R, Nelemans SA, Grootte Bromhaar MM, McKay S, Zaagsma J, Meurs H. Muscarinic M3-receptors mediate cholinergic synergism of mitogenesis in airway smooth muscle. Am J Respir Cell Mol Biol 2003; 28(2): 257-262. Prenzel N, Zwick E, Daub H, Leserer M, Abraham R, Wallasch C et al. EGF receptor transactivation by G-protein-coupled receptors requires metalloproteinase cleavage of proHB-EGF. Nature 1999; 402: 884-888. Tsai W, Morielli AD, Peralta EG. The m1 muscarinic acetylcholine receptor transactivates the EGF receptor to modulate ion channel activity. Embo J 1997; 16(15): 4597-4605. Stirnweiss J, Valkova C, Ziesche E, Drube S, Liebmann C. Muscarinic M2 receptors mediate transactivation of EGF receptor through Fyn kinase and without matrix metalloproteases. Cell Signal 2006; 18(8): 1338-1349. Cheng K, Zimniak P, Raufman JP. Transactivation of the epidermal growth factor receptor mediates cholinergic agonist-induced proliferation of H508 human colon cancer cells. Cancer Res 2003; 63(20): 6744-6450. Garrett JR, Kidd A. The innervation of salivary glands as revealed by morphological methods. Microsc Res Tech 1993; 26(1): 75-91. Ekstrom J. Autonomic control of salivary secretion. Proc Finn Dent Soc 1989; 85(4-5): 323-331; discussion 361-363. Garrett JR. The proper role of nerves in salivary secretion: a review. J Dent Res 1987; 66(2): 387-397. Ekstrom J. Role of nonadrenergic, noncholinergic autonomic transmitters in salivary glandular activities. In: Frontiers of Oral Biology, RWA Linden, (ed. ), Basel, Karger; 1999, pp 94-130. Edwards AV. Autonomic control of salivary blood flow. In: Frontiers of Oral Biology, RWA Linden, (ed. ), Basel, Karger; 1999, pp 101-117. Bloom SR, Edwards AV. Vasoactive intestinal peptide in relation to atropine resistant vasodilatation in the submaxillary gland of the cat. J Physiol 1980; 300: 41-53. Lundberg JM, Anggard A, Fahrenkrug J, Hokfelt T, Mutt V. Vasoactive intestinal polypeptide in cholinergic neurons of exocrine glands: functional significance of coexisting transmitters for vasodilation and secretion. Proc Natl Acad Sci U S A 1980; 77(3): 1651-1655. Lundberg JM, Anggard A, Fahrenkrug J. Complementary role of vasoactive intestinal polypeptide (VIP) and acetylcholine for cat submandibular gland blood flow and secretion. Acta Physiol Scand 1982; 114(3): 329-337. Edwards AV, Garrett JR. Nitric oxide-related vasodilator responses to parasympathetic stimulation of the submandibular gland in the cat. J Physiol 1993; 464: 379-392. Anderson LC, Garrett JR. Neural regulation of submandibular gland blood flow in the streptozotocin-diabetic rat: evidence for impaired endothelium-dependent vasodilatation. Arch Oral Biol 2004; 49(3): 183-191. Edwards AV, Tobin G, Ekstrom J, Bloom SR. Nitric oxide and release of the peptide VIP from parasympathetic terminals in the submandibular gland of the anaesthetized cat. Exp Physiol 1996; 81(3): 349-359. Lung MA. Variations in blood flow on mandibular glandular secretion to autonomic nervous stimulations in anaesthetized dogs. J Physiol 1990; 431: 479-493. Smaje LH, Gamble J. Transcapillary transport during secretion by the rabbit submandibular salivary gland. J Dent Res 1987; 66(2): 564-568. Lung MA. Autonomic nervous control of venous pressure and secretion in submandibular gland of anesthetized dogs. Am J Physiol 1998; 275: G331-G341. Thakor AS, Brown CN, Edwards AV. Effects of prolonged reduction in blood flow on submandibular secretory function in anesthetized sheep. J Appl Physiol 2003; 95(2): 751-757. Baum BJ, Wellner RB. Receptors in salivary glands. 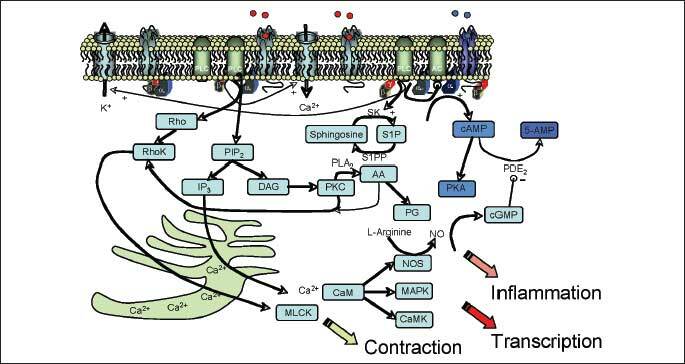 In: Neuronal Mechanisms of Salivary Secretion. JR Garrett, J Ekstrom, LC Anderson (eds). Basel, Karger; 1999, pp 44-58. Dai YS, Ambudkar IS, Horn VJ, Yeh CK, Kousvelari EE, Wall SJ et al. Evidence that M3 muscarinic receptors in rat parotid gland couple to two second messenger systems. Am J Physiol 1991; 261: C1063-C1073. Bockman CS, Bradley ME, Dang HK, Zeng W, Scofield MA, Dowd FJ. Molecular and pharmacological characterization of muscarinic receptor subtypes in a rat parotid gland cell line: comparison with native parotid gland. J Pharmacol Exp Ther 2001; 297(2): 718-726. Buckley NJ, Burnstock G. Autoradiographic localization of peripheral M1 muscarinic receptors using [3H]pirenzepine. Brain Res 1986; 375(1): 83-91. Hammer R, Berrie CP, Birdsall NJ, Burgen AS, Hulme EC. Pirenzepine distinguishes between different subclasses of muscarinic receptors. Nature 1980; 283: 90-92. Martos F, Monferini E, Giraldo E, De Paoli AM, Hammer R. Characterization of muscarinic receptors in salivary and lacrimal glands of the rat. Eur J Pharmacol 1987; 143(2): 189-194. Vilaro MT, Palacios JM, Mengod G. Localization of m5 muscarinic receptor mRNA in rat brain examined by in situ hybridization histochemistry. Neurosci Lett 1990; 114(2): 154-159. Flynn DD, Reever CM, Ferrari-DiLeo G. Pharmacological strategies to selectively label and localize muscarinic receptor subtypes. Drug Dev Res 1997; 40: 104-116. Khosravani N, Ekman R, Ekstrom J. Acetylcholine synthesis, muscarinic receptor subtypes, neuropeptides and secretion of ferret salivary glands with special reference to the zygomatic gland. Arch Oral Biol 2007; 52(5): 417-426. Mei L, Roeske WR, Izutsu KT, Yamamura HI. Characterization of muscarinic acetylcholine receptors in human labial salivary glands. Eur J Pharmacol 1990; 176(3): 367-370. Ryberg AT, Warfvinge G, Axelsson L, Soukup O, Gotrick B, Tobin G. Expression of muscarinic receptor subtypes in salivary glands of rats, sheep and man. Arch Oral Biol 2008; 53(1): 66-74. Tobin G. Muscarinic receptor subtypes in the submandibular gland and the urinary bladder of the rabbit: in vivo and in vitro functional comparisons of receptor antagonists. J Auton Pharmacol 1995; 15(6): 451-463. Meloy TD, Daniels DV, Hegde SS, Eglen RM, Ford AP. Functional characterization of rat submaxillary gland muscarinic receptors using microphysiometry. Br J Pharmacol 2001; 132(7): 1606-1614. Gautam D, Heard TS, Cui Y, Miller G, Bloodworth L, Wess J. Cholinergic stimulation of salivary secretion studied with M1 and M3 muscarinic receptor single- and double-knockout mice. Mol Pharmacol 2004; 66(2): 260-267. Nakamura T, Matsui M, Uchida K, Futatsugi A, Kusakawa S, Matsumoto N et al. M(3) muscarinic acetylcholine receptor plays a critical role in parasympathetic control of salivation in mice. J Physiol 2004; 558: 561-575. Bymaster FP, McKinzie DL, Felder CC, Wess J. Use of M1-M5 muscarinic receptor knockout mice as novel tools to delineate the physiological roles of the muscarinic cholinergic system. Neurochem Res 2003; 28: 437-442. Takeuchi J, Fulton J, Jia ZP, Abramov-Newerly W, Jamot L, Sud M et al. Increased drinking in mutant mice with truncated M5 muscarinic receptor genes. Pharmacol Biochem Behav 2002; 72: 117-123. Tobin G. Presynaptic muscarinic receptor mechanisms and submandibular responses to stimulation of the parasympathetic innervation in bursts in rats. Auton Neurosci 2002; 99(2): 111-118. Andersson PO, Bloom SR, Edwards AV, Jarhult J. Effects of stimulation of the chorda tympani in bursts on submaxillary responses in the cat. J Physiol 1982; 322: 469-483. Bloom SR, Edwards AV. The relationship between release of vasoactive intestinal peptide in the salivary gland of the cat in response to parasympathetic stimulation and the atropine resistant vasodilatation. J Physiol 1979; 295: 35-36. Andersson PO, Bloom SR, Edwards AV. Parotid responses to stimulation of the parasympathetic innervation in bursts in weaned lambs. J Physiol 1982; 330: 163-174. Tobin G, Ekstrom J, Edwards AV. Submandibular responses to stimulation of the parasympathetic innervation in bursts in the anaesthetized ferret. J Physiol (Lond) 1990; 431: 417-425. Pedersen AM, Dissing S, Fahrenkrug J, Hannibal J, Reibel J, Nauntofte B. Innervation pattern and Ca2+ signalling in labial salivary glands of healthy individuals and patients with primary Sjogren’s syndrome (pSS). J Oral Pathol Med 2000; 29(3): 97-109. Dawson LJ, Field EA, Harmer AR, Smith PM. Acetylcholine-evoked calcium mobilization and ion channel activation in human labial gland acinar cells from patients with primary Sjogren’s syndrome. Clin Exp Immunol 2001; 124(3): 480-485. Cha S, Singson E, Cornelius J, Yagna JP, Knot HJ, Peck AB. Muscarinic acetylcholine type-3 receptor desensitization due to chronic exposure to Sjogren’s syndrome-associated autoantibodies. J Rheumatol 2006; 33(2): 296-306. Waterman SA, Gordon TP, Rischmueller M. Inhibitory effects of muscarinic receptor autoantibodies on parasympathetic neurotransmission in Sjogren’s syndrome. Arthritis Rheum 2000; 43(7): 1647-`1654. Haarala M, Alanen A, Hietarinta M, Kiilholma P. Lower urinary tract symptoms in patients with Sjogren’s syndrome and systemic lupus erythematosus. Int Urogynecol J Pelvic Floor Dysfunct 2000; 11(2): 84-86. Beroukas D, Goodfellow R, Hiscock J, Jonsson R, Gordon TP, Waterman SA. Up-regulation of M3-muscarinic receptors in labial salivary gland acini in primary Sjogren’s syndrome. Lab Invest 2002; 82(2): 203-210. Wang F, Jackson MW, Maughan V, Cavill D, Smith AJ, Waterman SA et al. Passive transfer of Sjogren’s syndrome IgG produces the pathophysiology of overactive bladder. Arthritis Rheum 2004; 50(11): 3637-3645. Mignogna MD, Fedele S, Lo Russo L, Lo Muzio L, Wolff A. Sjogren’s syndrome: the diagnostic potential of early oral manifestations preceding hyposalivation/xerostomia. J Oral Pathol Med 2005; 34(1): 1-6. Mignogna MD, Fedele S, Lo Russo L, Lo Muzio L. Sialorrhoea as early oral clinical manifestation of primary Sjogren’s syndrome? Rheumatology (Oxford) 2003; 42(9): 1113-1114. Cook DI, Van Lennep EW, Roberts ML, Young JA. Secretion by the major salivary glands. In: Physiology of the Gastrointestinal Tract. LR Johnson (ed). New York, Raven Press, 1994, pp 1061-1117. Edwards CM, Corkery PP, Edwards AV. Submandibular responses to stimulation of the parasympathetic innervation in anesthetized sheep. J Appl Physiol 2003; 95(4):1598-1605. Emmelin N, Garrett JR, Ohlin P. Neural control of salivary myoepithelial cells. J Physiol 1968; 196(2): 381-396. Ryberg AT, Selberg H, Soukup O, Gradin K, Tobin G. Cholinergic submandibular effects and muscarinic receptor expression in blood vessels of the rat. Arch Oral Biol 2008; 53(7): 605-616. Ding X, Murray PA. Regulation of pulmonary venous tone in response to muscarinic receptor activation. Am J Physiol Lung Cell Mol Physiol 2005; 288(1): L131-L140. Wang M, Lung MA. Acetylcholine induces contractile and relaxant effects in canine nasal venous systems. Eur Respir J 2006; 28(4): 839-846. Berggreen E, Wiig H. Lowering of interstitial fluid pressure in rat submandibular gland: a novel mechanism in saliva secretion. Am J Physiol Heart Circ Physiol 2006; 290(4): H1460-H1468. Smaje LH. Spontaneous salivation in the rabbit submandibular gland. J Physiol 1973; 231(1): 179-193. Hanna-Mitchell AT, Beckel JM, Barbadora S, Kanai AJ, de Groat WC, Birder LA. Non-neuronal acetylcholine and urinary bladder urothelium. Life Sci 2007; 80(24-25): 2298-2302. Kim DK, Prabhakar NR, Kumar GK. Acetylcholine release from the carotid body by hypoxia: evidence for the involvement of autoinhibitory receptors. J Appl Physiol 2004; 96(1): 376-383. Kummer W, Haberberger R. Extrinsic and intrinsic cholinergic systems of the vascular wall. Eur J Morphol 1999; 37(4-5): 223-226. Kirkpatrick CJ, Bittinger F, Unger RE, Kriegsmann J, Kilbinger H, Wessler I. The non-neuronal cholinergic system in the endothelium: evidence and possible pathobiological significance. Jpn J Pharmacol 2001; 85(1): 24-28. Ekstrom J. Acetylcholine synthesis and its dependence on nervous activity. Experientia 1978; 34(10): 1247-1253. Koop I, Squires PE, Meloche RM, Buchan AM. Effect of cholinergic agonists on gastrin release from primary cultures of human antral G cells. Gastroenterology 1997; 112(2): 357-363. Li YY. Mechanisms for regulation of gastrin and somatostatin release from isolated rat stomach during gastric distention. World J Gastroenterol 2003; 9(1): 129-133. Lawton DE, Simcock DC, Candy EJ, Simpson HV. Gastrin secretion by ovine antral mucosa in vitro. Comp Biochem Physiol A Mol Integr Physiol 2000; 126(2): 233-243. Norlen P, Bernsand M, Konagaya T, Hakanson R. ECL-cell histamine mobilization in conscious rats: effects of locally applied regulatory peptides, candidate neurotransmitters and inflammatory mediators. Br J Pharmacol 2001; 134(8): 1767-1777. Lindstrom E, Hakanson R. Neurohormonal regulation of secretion from isolated rat stomach ECL cells: a critical reappraisal. Regul Pept 2001; 97: 169-180. Sachs G, Zeng N, Prinz C. Physiology of isolated gastric endocrine cells. Annu Rev Physiol 1997; 59: 243-256. Sandor A, Kidd M, Lawton GP, Miu K, Tang LH, Modlin IM. Neurohormonal modulation of rat enterochromaffin-like cell histamine secretion. Gastroenterology 1996; 110(4): 1084-1092. Aihara T, Nakamura Y, Taketo MM, Matsui M, Okabe S. Cholinergically stimulated gastric acid secretion is mediated by M(3) and M(5) but not M(1) muscarinic acetylcholine receptors in mice. Am J Physiol Gastrointest Liver Physiol 2005; 288(6): G1199-G1207. Kajimura M, Reuben MA, Sachs G. The muscarinic receptor gene expressed in rabbit parietal cells is the M3 subtype. Gastroenterology 1992; 103(3): 870-875. Schubert ML. Gastric secretion. Curr Opin Gastroenterol 2000; 16(6): 463-468. Aihara T, Fujishita T, Kanatani K, Furutani K, Nakamura E, Taketo MM et al. Impaired gastric secretion and lack of trophic responses to hypergastrinemia in M3 muscarinic receptor knockout mice. Gastroenterology 2003; 125(6): 1774-1784. Wada K, Sakamoto C, Matozaki T, Nishisaki H, Konda Y, Nakano O et al. M3 muscarinic receptors mediate pepsinogen secretion via polyphosphoinositide hydrolysis in guinea pig gastric chief cells. Gastroenterol Jpn 1992; 27(4): 473-481. Xie G, Drachenberg C, Yamada M, Wess J, Raufman JP. Cholinergic agonist-induced pepsinogen secretion from murine gastric chief cells is mediated by M1 and M3 muscarinic receptors. Am J Physiol Gastrointest Liver Physiol 2005; 289(3): G521-G529. Blandizzi C, Colucci R, Carignani D, Lazzeri G, Del Tacca M. Positive modulation of pepsinogen secretion by gastric acidity after vagal cholinergic stimulation. J Pharmacol Exp Ther 1997; 283(3): 1043-1050. Rumessen JJ, Vanderwinden JM. Interstitial cells in the musculature of the gastrointestinal tract: Cajal and beyond. Int Rev Cytol 2003; 229: 115-208. Ward SM, McLaren GJ, Sanders KM. Interstitial cells of Cajal in the deep muscular plexus mediate enteric motor neurotransmission in the mouse small intestine. J Physiol 2006; 573: 147-159. Wang XY, Sanders KM, Ward SM. Relationship between interstitial cells of Cajal and enteric motor neurons in the murine proximal colon. Cell Tissue Res 2000; 302(3): 331-342. Ward SM, Beckett EA, Wang X, Baker F, Khoyi M, Sanders KM. Interstitial cells of Cajal mediate cholinergic neurotransmission from enteric motor neurons. J Neurosci 2000; 20(4): 1393-1403. Furness JB. Novel gut afferents: Intrinsic afferent neurons and intestinofugal neurons. Auton Neurosci 2006; 125(1-2): 81-85. Burns AJ, Lomax AE, Torihashi S, Sanders KM, Ward SM. Interstitial cells of Cajal mediate inhibitory neurotransmission in the stomach. Proc Natl Acad Sci U S A 1996; 93(21): 12008-12013. Suzuki T, Won KJ, Horiguchi K, Kinoshita K, Hori M, Torihashi S et al. Muscularis inflammation and the loss of interstitial cells of Cajal in the endothelin ETB receptor null rat. Am J Physiol Gastrointest Liver Physiol 2004; 287(3): G638-G646. Torihashi S, Ward SM, Nishikawa S, Nishi K, Kobayashi S, Sanders KM. c-kit-dependent development of interstitial cells and electrical activity in the murine gastrointestinal tract. Cell Tissue Res 1995; 280(1): 97-111. Stengel PW, Cohen ML. M1 receptor-mediated nitric oxide-dependent relaxation unmasked in stomach fundus from M3 receptor knockout mice. J Pharmacol Exp Ther 2003; 304(2): 675-682. Moro E, Crema F, Dandolo C, De Ponti F, Frigo G. Effect of muscarinic receptor blockade on canine gastric tone and compliance in vivo. Pharmacol Res 2005; 51(4): 289-296. Hammer R. Muscarinic receptors in the stomach. Scand J Gastroenterol Suppl 1980; 66: 5-11. Lambrecht G, Gross J, Mutschler E. Neuronal soma-dendritic and prejunctional M1-M4 receptors in gastrointestinal and genitourinary smooth muscle. Life Sci 1999; 64: 403-410. Krokhina EM. Sympathetic innervation of the gastrointestinal tract of mammals. Arch Anat Microsc Morphol Exp 1973; 62(3): 307-321. Takeuchi K, Niida H, Minami M, Okabe S. Determination of bicarbonate output using pH deflection in the rat duodenum: influences of prostaglandins and cholinergic agents. Jpn J Pharmacol 1990; 52(2): 225-232. Hogan DL, Yao B, Steinbach JH, Isenberg JI. The enteric nervous system modulates mammalian duodenal mucosal bicarbonate secretion. Gastroenterology 1993; 105(2): 410-417. Safsten B, Jedstedt G, Flemstrom G. Cholinergic influence on duodenal mucosal bicarbonate secretion in the anesthetized rat. Am J Physiol 1994; 267: G10-G17. Takeuchi K, Niida H, Okabe S. Characterization of alkaline response induced by cholinergic agents in the rat duodenum: involvement of M2 receptors and the calcium-dependent process. J Pharmacol Exp Ther 1990; 254(2): 465-470. Ballesteros MA, Wolosin JD, Hogan DL, Koss MA, Isenberg JI. Cholinergic regulation of human proximal duodenal mucosal bicarbonate secretion. Am J Physiol 1991; 261: G327-G331. Jonson C, Nylander O, Flemstrom G, Fandriks L. Vagal stimulation of duodenal HCO3(-)-secretion in anaesthetized rats. Acta Physiol Scand 1986; 128(1): 65-70. Glad H, Svendsen P, Olsen O, Schaffalitzky de Muckadell OB. Importance of vagus nerves in duodenal acid neutralization in anesthetized pigs. Am J Physiol 1997; 272: G154-G160. Forssell H, Stenquist B, Olbe L. Vagal stimulation of human gastric bicarbonate secretion. Gastroenterology 1985; 89(3): 581-586. Forssell H, Lind T, Olbe L. Comparative potency of carbachol, sham feeding, fundic distension and 16,16-dimethyl prostaglandin E2 as stimulants of human gastric bicarbonate secretion. Acta Physiol Scand 1988; 134(1): 75-78. Konturek SJ, Thor P, Bilski J, Tasler J, Cieszkowski M. Cephalic phase of gastroduodenal alkaline secretion. Am J Physiol 1987; 252: G742-G747. Larsen R, Hansen MB, Bindslev N, Mertz-Nielsen A. Functional characterization of muscarinic receptor subtypes in human duodenal secretion. Acta Physiol Scand 2004; 182(1): 63-68. Jodal M, Hallback DA, Lundgren O. Tissue osmolality in intestinal villi during luminal perfusion with isotonic electrolyte solutions. Acta Physiol Scand 1978; 102(1): 94-107. Jodal M, Lundgren O. Countercurrent mechanisms in the mammalian gastrointestinal tract. Gastroenterology 1986; 91(1): 225-241. Karlstrom L, Jodal M, Lundgren O. Blood flow distribution, lymph flow, villus tissue osmolality and fluid and electrolyte transport after exposing the cat small intestine to sodium deoxycholate. Acta Physiol Scand 1986; 128(1): 83-96. Furness JB. The organisation of the autonomic nervous system: peripheral connections. Auton Neurosci 2006; 130: 1-5. Sjovall H, Redfors S, Hallback DA, Eklund S, Jodal M, Lundgren O. The effect of splanchnic nerve stimulation on blood flow distribution, villous tissue osmolality and fluid and electrolyte transport in the small intestine of the cat. Acta Physiol Scand 1983; 117(3): 359-365. Sjovall H, Brunsson I, Jodal M, Lundgren O. The effect of vagal nerve stimulation on net fluid transport in the small intestine of the cat. Acta Physiol Scand 1983; 117(3): 351-357. Greenwood B, Read NW. Vagal control of fluid transport, transmural potential difference, and motility in the ferret jejunum. Am J Physiol 1985; 249: G651-G654. Greenwood B, Davison JS. Investigation of the vagally induced changes in transmural potential difference in the ferret jejunum in vivo. J Auton Nerv Syst 1987; 19(2): 113-118. Barrett KE, Keely SJ. Chloride secretion by the intestinal epithelium: molecular basis and regulatory aspects. Annu Rev Physiol 2000; 62: 535-572. Hulten L, Jodal M, Lundgren O. The effects of graded electrical stimulation or reflex activation of the sympathetic and the parasympathetic nerve supply on the regional blood flow in cat colon. Bibl Anat 1969; 10: 312-315. Wright RD, Florey HW, Jennings MA. The secretion of the colon of the cat. Q J Exp Physiol Cogn Med Sci 1938; 28(3): 207-229. Zimmerman TW, Dobbins JW, Binder HJ. Mechanism of cholinergic regulation of electrolyte transport in rat colon in vitro. Am J Physiol 1982; 242(2): G116-G123. Zimmerman TW, Binder HJ. Muscarinic receptors on rat isolated colonic epithelial cells. A correlation between inhibition of [3H]quinuclidinyl benzilate binding and alteration in ion transport. Gastroenterology 1982; 83(6): 1244-1251. Rimele TJ, O’Dorisio MS, Gaginella TS. Evidence for muscarinic receptors on rat colonic epithelial cells: binding of [3H]quinuclidinyl benzilate. J Pharmacol Exp Ther 1981; 218(2): 426-434. Isaacs PE, Whitehead JS, Kim YS. Muscarinic acetylcholine receptors of the small intestine and pancreas of the rat: distribution and the effect of vagotomy. Clin Sci (Lond) 1982; 62(2): 203-207. Wahawisan R, Wallace LJ, Gaginella TS. Muscarinic receptors on rat ileal villus and crypt cells. J Pharm Pharmacol 1986; 38(2): 150-153. Cooke HJ. Neurobiology of the intestinal mucosa. Gastroenterology 1986; 90(4): 1057-1081. Mellander A, Abrahamsson H, Sjovall H. The migrating motor complex—the motor component of a cholinergic enteric secretomotor programme? Acta Physiol Scand 1995; 154(3): 329-341. Lundgren O, Jodal M. The enteric nervous system and cholera toxin-induced secretion. Comp Biochem Physiol A Physiol 1997; 118(2): 319-327. Lindqvist SM, Sharp P, Johnson IT, Satoh Y, Williams MR. Acetylcholine-induced calcium signaling along the rat colonic crypt axis. Gastroenterology 1998; 115(5): 1131-1143. Lindqvist S, Hernon J, Sharp P, Johns N, Addison S, Watson M et al. The colon-selective spasmolytic otilonium bromide inhibits muscarinic M(3) receptor-coupled calcium signals in isolated human colonic crypts. Br J Pharmacol 2002; 137(7): 1134-1142. Specian RD, Neutra MR. Regulation of intestinal goblet cell secretion. I. Role of parasympathetic stimulation. Am J Physiol 1982; 242(4): G370-G379. Phillips TE, Phillips TH, Neutra MR. Regulation of intestinal goblet cell secretion. IV. Electrical field stimulation in vitro. Am J Physiol 1984; 247: G682-G687. Mantle M, Thakore E, Mathison R, Davison JS. Intestinal mucin secretion in streptozotocin-diabetic rats: lack of response to cholinergic stimulation and cholera toxin. Dig Dis Sci 1991; 36(11): 1574-1581. Moore BA, Sharkey KA, Mantle M. Neural mediation of cholera toxin-induced mucin secretion in the rat small intestine. Am J Physiol 1993; 265: G1050-G1056. Moore BA, Sharkey KA, Mantle M. Role of 5-HT in cholera toxin-induced mucin secretion in the rat small intestine. Am J Physiol 1996; 270: G1001-G1009. Furuya S, Naruse S, Hayakawa T. Intravenous injection of guanylin induces mucus secretion from goblet cells in rat duodenal crypts. Anat Embryol (Berl) 1998; 197(5): 359-367. Kanno H, Horikawa Y, Hodges RR, Zoukhri D, Shatos MA, Rios JD et al. Cholinergic agonists transactivate EGFR and stimulate MAPK to induce goblet cell secretion. Am J Physiol Cell Physiol 2003; 284(4): C988-C998. Specian RD, Neutra MR. Mechanism of rapid mucus secretion in goblet cells stimulated by acetylcholine. J Cell Biol 1980; 85(3): 626-640. Greenwood B, Mantle M. Mucin and protein release in the rabbit jejunum: effects of bethanechol and vagal nerve stimulation. Gastroenterology 1992; 103(2): 496-505. Rios JD, Forde K, Diebold Y, Lightman J, Zieske JD, Dartt DA. Development of conjunctival goblet cells and their neuroreceptor subtype expression. Invest Ophthalmol Vis Sci 2000; 41(8): 2127-2137. Motterle L, Diebold Y, Enriquez de Salamanca A, Saez V, Garcia-Vazquez C, Stern ME et al. Altered expression of neurotransmitter receptors and neuromediators in vernal keratoconjunctivitis. Arch Ophthalmol 2006; 124(4): 462-468. Bjerknes M, Cheng H. Modulation of specific intestinal epithelial progenitors by enteric neurons. Proc Natl Acad Sci U S A 2001; 98(22): 12497-12502. Maximow AA, Bloom WA. Textbook of Histology. 10th ed. Philadelphia, W. B. Saunders; 1957. Sundstrom G, Helander HF. Quantitative electron microscopic studies on rat ileal Paneth cells under various physiological and experimental conditions. Hepatogastroenterology 1980; 27(4): 286-293. Satoh Y. Atropine inhibits the degranulation of Paneth cells in ex-germ-free mice. Cell Tissue Res 1988; 253(2): 397-402. Satoh Y, Ishikawa K, Oomori Y, Takeda S, Ono K. Bethanechol and a G-protein activator, NaF/AlCl3, induce secretory response in Paneth cells of mouse intestine. Cell Tissue Res 1992; 269(2): 213-220. Satoh Y, Ono K, Moutairou K. Paneth cells of African giant rats (Cricetomys gambianus). Acta Anat (Basel) 1994; 151(1): 49-53. Gosling JA, Dixon JS. The structure and innervation of smooth muscle in the wall of the bladder neck and proximal urethra. Br J Urol 1975; 47(5): 549-558.